For those of us who own Ayrshires, we know the breed’s potential. It’s up to us to spread the word and show breeders around the country what Ayrshires have to offer. 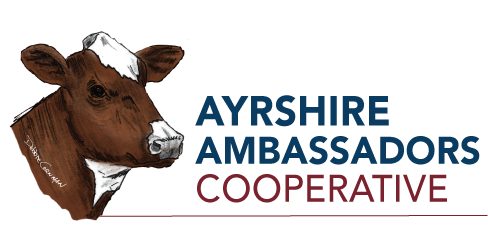 By joining Ayrshire Ambassadors Cooperative, you can support our efforts to market and promote the breed. With 4 current breeder memberships, we can cover the cost to put an ad in Farmshine, which will promote the superior qualities of the Ayrshire breed and encourage buyers to seek them out at sales. With 5 memberships, we can reach new audiences (such as organic farmers looking for cows well-suited to organic farming practices) through an advertisement in Acres U.S.A., a national magazine that offers a comprehensive guide to sustainable agriculture. These are just a few of the ways we can utilize membership fees to promote the breed. We will have many more opportunities as we grow our funds. Your membership during these early stages of the cooperative is critical. The more members we have, the more promotion and marketing we can do to enlighten breeders of other color cows about the superior qualities of the Ayrshire Breed. Over time, as word spreads about the great qualities of the Ayrshire, the breed will grow in numbers. But first, we need your help to support our marketing efforts. Click HERE for information about benefits you’ll receive from joining. Remember, even as a student (high school or college), you can contribute. We offer memberships for students, current and new breeders, retired breeders, Ayrshire clubs, and Ag-related organizations.